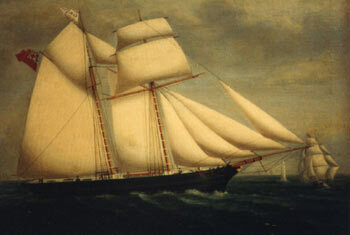 The 130-ton schooner “Mary Watkins” was built by Owen Jones, Nefyn in 1850 for Watkin and Mary Williams, Tŷ Gwyn, Porthdinllaen. She was 72 feet long, had a beam of 20 foot, and a draft of 12 feet. Her first Captain was John Williams, son of the owners. She was primarily built for coastal to middle trade, and her logs for 1859 1860 and up to May 1861 are testament to this. Ships would wait in port for many days or even weeks at a time for a cargo, and this was quite clearly the case with this vessel, as can be seen in the logs below. In 1865 she came back to the shipyard at Nefyn, where she was lengthened to 91 feet, her draft increased to 13 foot and her tonnage to 169. This was quite a common practice during the nineteenth century, as it is today. She continued to trade for another 23 years, but like so many sailing vessels of this period, was lost at sea; she foundered in a storm off Cape Carvoiero, Portugal (80 kilometers north of Lisbon) in 1888. Thanks to Mr T Morris for his help with this article.